I first started making jewelry as a hobby about 11 years ago. I was working full-time in communications in New York City at the time, and took it up as a hobby and to relieve stress. You can buy beads from the store and use them to make your jewelry, but it's really not as interesting or exciting as creating them yourself. Same with social media: having an authentic voice and an original way of expressing yourself is huge. Just look at Chris Brogan. Not everyone fits into every style or size, so you need to offer variety, and to customize. I've made pins, earrings, necklaces, and bracelets, and most of them are adjustable in size to fit anyone. Same with social media: you need to have a variety of online profiles, because not everyone takes in information the same way. Some people only read blogs, some only watch videos, and some are only on Twitter. That's just the way it is. The best products should last a long time. When I make my jewelry, I make sure to check all the hoops and catches and links to make sure all is secure. Same with social media: your posts, updates, and other communications should have a staying power. Maybe that is evidenced in clients, or purchases, attendance at events, shares, likes, and retweets. A great blog post should still be great a year later. 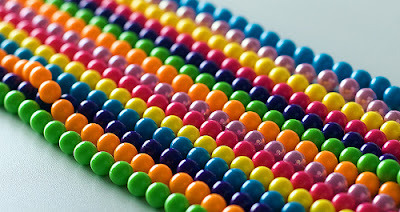 It used to take me hours to make just one bead, and hours after that to make just one necklace. I had to have patience, and not rush things. Same with social media: You can't rush your online relationships, or your transactions, friendships or follows. If they arise and multiply organically, as a natural evolution to your real life meetings, work related activities, social circles, or mutual interests, they are much more likely to thrive. What a great feeling when someone notices your earrings or bracelet! That means they'll also likely tell someone else about it, or even better -- you! Same with social media: people notice when you upload great content that is relevant to their lives and businesses. Noticing in social media means reposting, tweeting, following, Liking. It's easier to be creative when you feel like you're putting yourself into whatever project you are working on. Same with social media: People can tell when the real you is talking, putting yourself out there, taking a risk. Online, it may take the form of telling a story, or being transparent about an event or a person, or even your business and how you make money or fixed a mistake. No matter how beautiful or intricate a jewelry component is, it doesn't look right unless the rest of the complete piece looks good too. With social media, if you only have a great blog post or series of tweets, it's not going to get you very far. You need a larger whole that makes sense - your website, blog, online store, and information products all need to be high quality as well, and reflect your image and brand. When I did craft shows, I learned a lot about how to make the items I was selling pop. I learned about wonderful glass cases and wooden displays - and in the end, chose to show my earrings and bracelets in a bed of rice. Yes, that's right - rice. The delicacy of the grains, as well as their perfect beige and off white tones, really set off the colors of the jewelry perfectly. What's your social media presentation? How do you best show what you have to offer? Think of how your products, website, copy, and graphics, all reflect you in the best possible light. When crafting a necklace, some of the most impactful and impressive patterns are those that repeat. A purple bead, for example, followed by a pearl, followed by a red and orange swirl and spacer. Repeat. That's it. The presence of a distinguishable pattern is not only pleasurable to the eye, but shows that as a craftsperson, you paid attention to detail, and worked on your brand. Who else made that same pattern as you? No one. Of course with social media, and any online marketing, you need to repeat what you offer at least several times. They say it takes 8 customer views in order to make a sale, and from my experience, that's about right. Keep getting your message out, along with your call to action, and you'll get responses. Everyone loves a set. Something created beforehand, that goes together, all the parts thought out and intertwined. It was always worth it for me to spend the extra time making matching earrings to go with a bracelet, or matching necklace to go with the earrings. Usually, I had the ingredients on hand, and it was just a matter of making a new piece from what I had. Maybe it took longer, but I was able to sell it for more. And so in social media and online marketing, a system is great to have. That's why about a year ago, I launched my social media packages, because I realized that customers were looking for convenience, and needed several solutions at once. How could they start a newsletter when they didn't even have time to blog? How could they launch Facebook when they didn't even have time to tweet? The packages solved all that, with a range of monthly services, depending on the need. So, how do your creative endeavors add up in the social media space? If you're not ready but you need to be...get crafting!